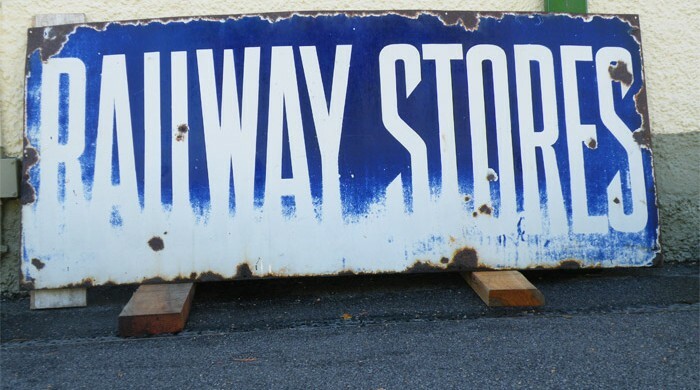 The Museum’s latest acquisition is a 180 x 75 cm blue & white enamel Railway Stores sign, donated by Dr. Chris Robinson, a former Museum trustee. It had been found lying face down on the floor of an old barn in Lochailort. The sign used to adorn the store in the navvies’ Kinlochailort encampment, 1897 – 1901, while the West Highland Mallaig Extension was being constructed. Contractor Robert McAlpine & Sons set up a string of such stores along the Extension route to make sure the men were provided with food, tea, tobacco, clothes and other goods. And to make sure they would always be able to pay for their groceries, even after the pay-day whisky had been enjoyed, part of their wages were paid out in tokens, redeemable only at the Railway Stores. The stores were run by up-market grocers Cooper & Co. of Glasgow. We suspect it was Robert McAlpine Jnr, Concrete Bob’s 28-year-old newly-married son, who negotiated the deal with Cooper & Co. Robert Jnr had been put in charge of the Mallaig Extension contract by his father. Thomas Bishop, Cooper’s proprietor, was Robert Jnr’s father-in-law. The sign will form part of the Museum’s permanent exhibition from May 2014.